Extinction rates are 100 to 1000 times higher than before the global spread of humanity, and human impact on the environment continues to grow, diminishing biodiversity and compromising our resilience. An urgent need exists for broader research and understanding of the identity and biology of species that compose biodiversity. The inadvertent degradation of the natural world can be slowed, or even halted, through biodiversity research that expands our understanding of our ‘little known planet’ and that innovates in helping us to learn how to best care for it. The All Taxa Biodiversity Inventory (ATBI)/BioBlitz SWAT Teams are graduate students who survey gaps in biodiversity understanding on vital public and private lands, design field research that narrows those gaps and create media about their work that fosters public understanding and inspires better care of our planet. The ATBI/BioBlitz SWAT Team has worked in Rocky Mountain National Park and the Great Smoky Mountains National Park and will be at the Turner family’s Ladder Ranch in New Mexico in 2016. The ATBI/BioBlitz SWAT Team projects are executed in cooperation with the National Park Service, Discover Life in America and Turner Endangered Species Fund. The SWAT Team catalyzes biodiversity inventory and research on some of the most important public and private lands in the country while cultivating awareness of the importance of biodiversity and environmental conservation on a local and national level. Biological diversity is still being discovered in our parks and private lands. Through ATBIs or BioBlitzes, specimens are collected, identified, and added to checklists, reports, maps, databases, and natural history profiles and that can be used to help inform park and land managers of changes to the ecosystem that require attention, or changes in management. 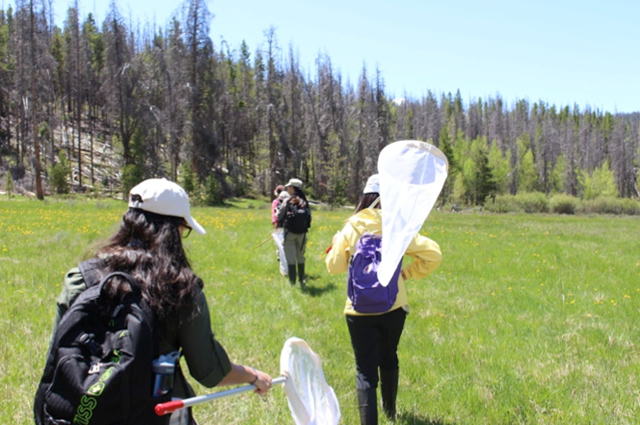 The ATBI/BioBlitz SWAT Teams work with national parks and private land owners to synthesize information about existing species and identify gaps in biodiversity inventory. They create a field exercise to narrow that gap, and explore management considerations. In addition, the SWAT Team helps facilitate a deeper understanding of the importance of biodiversity through the creation of story that engenders broader public understanding and action. Through ongoing annual support of this project we are creating a perpetual team of graduate student experts, and future ATBI advisors, that can be dispatched to national parks and other vital habitats to support the collection, interpretation and dissemination of species data critical to the ecosystems that form the fabric our lives. In 2015, Micah Jasny worked to discover new species to add to the Great Smoky Mountain National Park inventory. 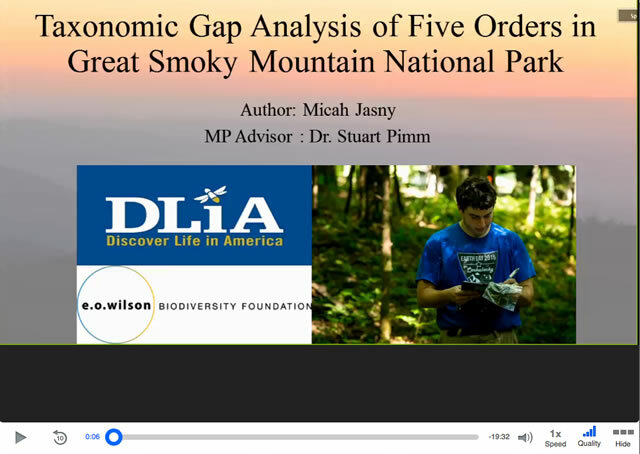 In this talk at the Nicholas School for the Environment at Duke University, he covers how he investigated where gaps existed, the size of gaps, and the total estimate of species richness. He details the tools he used, including EstimateS and Maxtent, to model species richness and distribution. He concludes his talk with recommendations for future studies, and how best to engage the general public around the topic of biodiversity. In 2014, the team identified gaps in the current species database at Rocky Mountain National Park, ultimately designing a spider survey in the park. “Caught in the Web” documents their summer experience and relates a story that inspires action to preserve biodiversity in our national parks and vital natural spaces. The E.O. Wilson Biodiversity Foundation’s mission is to foster a knowing stewardship of our world through biodiversity research and education initiatives that promote and inform worldwide preservation of our biological heritage. We believe that by enhancing our public understanding of biodiversity, we can foster a culture of stewardship in which people are inspired to conserve and protect the natural world. We are biodiversity advocates. We champion expanding knowledge and understanding of biodiversity in all its detail and complexity in order to best care for the living world. We seek to undertake and promote field research to develop a more comprehensive database of the earth’s vast biodiversity, and to foster the use of this data as a fundamental tool for the preservation of biodiversity.